Last year, Elmo and I found this book: ‘My Grandmother’s Family Kitchen: 100 Family Recipes and Life Lessons, a food autobiography of sorts by Eileen Yin-Fei Lo, an American-Chinese foodie. Lo speaks about the migration experience, focussing on the inheritance of food and kitchen-life traditions from her grandmother and her mother. This book has many recipes (including Wintermelon Soup, Won Ton, Radish cakes) that remind me of simple dishes my nana taught me when I was a kid. 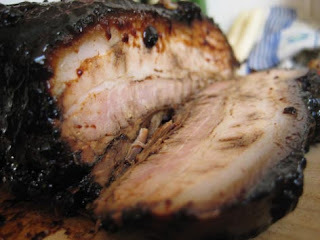 I’ve been casually flipping through and getting nostalgic, but with the cooler weather in the last couple of days, the first recipe we tried was Five-Spice Pork Belly. This recipe is super-easy and results in beautifully tender meat and a rich, syrupy aromatic sauce. And because it simmers for four hours on the stove, your senses will thank you because your place will smell like heaven, I guarantee! Place water, sugar, ginger, spring onions and five spices into a large pot. Stir to blend, add pork belly. As it boils, add soy sauce and stir. Return to a boil, add Shao-Hsing wine and mix. Return again to a boil. Lower heat, cover pot, leaving a slight opening at the lid and simmer for four hours. As it simmers, turn meat over. After four hours, close lid and allow meat to come to room temperature. Place entire contents of pot into a large bowl and refrigerate overnight. This allows the meat to further absorb the spices. (This is also a good opportunity to remove any fat that will solidify overnight). 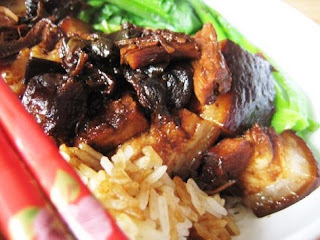 We served our pork belly on rice with choy sum. Looks and sounds delicious - I love pork belly!